After a subtle restyle for the 2006 model year, the Infiniti FX lineup sees only small changes for 2007. The FX35 receives new 18-inch wheels, while the FX45 getsa new power folding side-view mirror. Interior refinements include a new seatbelt reminder system and available iPod accessory. 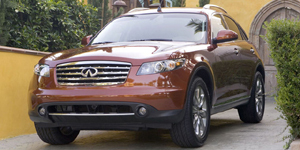 The 2007 Infiniti FX SUV is powered by a base 3.5-liter V6 with 275 hp. Also available is a 4.5-liter V8 with 320 hp. Find the used Infiniti FX of your choice from a dealer in your area. Search our used car listings now.